The 7th Guards Mountain Air Assault Division is an elite guards division of the Russian Airborne Troops. The 7th Guards Airborne Division was formed in September 1948 based on 322nd Guards Rifle Regiment which fought in Eastern Europe in World War II. In October 1948 the division was relocated to Kaunas, Lithuania. During the Cold War period, the division served in the suppression of the Hungarian and Czech revolutions. On August 1993, the division was relocated to Novorossisk, Russia. It took part in various counter-insurgency operations in the Caucasus region. On 1 December 2006 it was renamed as 7th Guards Mountain Air Assault Division. In 2014 the division's 247th Guards Air Assault Regiment took part in the War in Donbass in Ukraine. There were two separately formed 7th Guards Airborne Divisions in the Red Army and Soviet Ground Forces/Soviet Airborne Troops. The first division was formed during the Second World War at Ramenskoye in December 1942. It fought at Demyansk, Voronezh, Korsun, on the Dnieper River, and at Targul Frumos and Budapest. It ended the war with 4th Guards Army of the 3rd Ukrainian Front in May 1945. As part of a postwar military reorganization, this division was retitled the 115th Guards Rifle Division in June 1945. The second formation of the 7th Guards Airborne Division was started in September 1948 based on 322nd Guards Rifle Regiment. The first formation of the division was formed during the Second World War at Ramenskoye in December 1942. It fought at Demyansk, Voronezh, Korsun, on the Dnieper River, and at Targul Frumos and Budapest. On May 8, 1945, the divisional commander, Major General Dmitrii Aristarkhovich Drichkin, set up his headquarters in the village of Erlauf, Austria, some 60 miles west of Vienna and 50 miles east of Linz. Anxious to meet the Allies, he sent out scouts. At midnight, he met Major General Stanley Eric Reinhart, commander of the U.S. 65th Infantry Division. For the duration of their presence on the Danube river, both commanders continued to cooperate in an unusually effective manner. Twenty years later, public affairs officer Captain John J. Pullen described their first cordial encounter for the National Observer. For the 50th anniversary, Erlauf erected a Soviet-sponsored memorial. It features a local girl, linking arms with a GI on her right, and a Soviet soldier on her left. To this day, an enlarged photo and a small exhibit mark the spot where this historic encounter took place: A life-size Major General Reinhart, smiling at General Drichkin, as they compare their watches one minute past midnight, on 9 May 1945, the moment the unconditional surrender of Germany became effective. As part of a postwar military reorganization at the end of June 1945, the first formation of the 7th Guards Airborne Division was retitled as the 115th Guards Rifle Division. The 22nd Guards Tank Division was activated on 4 June 1957 in Novomoskovsk (Cherkasskoye), Dnepropetrovsk Oblast, from the 115th Guards Rifle Division. The baptism of fire of the second formation division's predecessor regiment took place in 1945, fighting around Lake Balaton (Hungary) under the 37th Guards Rifle Corps, 9th Guards Army, 3rd Ukrainian Front. On 26 April 1945, the 322nd Guards Rifle Regiment of the 103rd Guards Rifle Division was awarded the Order of Kutuzov, second class, for exemplary performance. In commemoration, the division's official day is 26 April, by an order of the Defense Minister of the USSR. At the end of the war, the 322nd Guards Rifle Regiment was in the city of Trebon, Czechoslovakia. During the war, the regiment was thanked on six occasions by the Stalin, the Supreme Commander. In all 2,065 of its soldiers, sergeants and officers were decorated for valor and heroism by the Soviet Union. The 7th Guards Airborne Division (second formation) was established on 15 October 1948 on the basis of the 322nd Guards Air Landing Regiment of the 103rd Guards Airborne Division at Polotsk in the Belorussian Military District, becoming part of the 8th Guards Airborne Corps. The division was relocated to the cities of Kaunas and Marijampole, Lithuanian SSR. Personnel from these bases took part in actions against Lithuanian partisans. Units in this premier division of airborne troops have mastered the landing of Antonov An-8, An-12, An-22, and Il-76 aircraft, tested a number of new parachute systems (D-5 and D-6), all generations of BMD, and 2S9 Nona artillery systems. In 1956, the division was involved in "Operation Whirlwind", the suppression of the Hungarian revolution. On 3 November 1956, the 108th Parachute Regiment landed at the Tököl airbase in Il-12 and Li-2 aircraft, capturing and disabling six antiaircraft batteries, then positioning themselves to defend the base. On 4 November 1956 the regimental staff, together with fighters from the 119th Parachute Regiment, entered the city of Budapest and took part in street fighting until the city was secured on 7 November. In 1968, the division participated in Operation Danube to suppress the Prague Spring uprising. The 108th Regiment distinguished itself in the most dangerous and difficult missions, for which about two hundred of its personnel received high government awards. 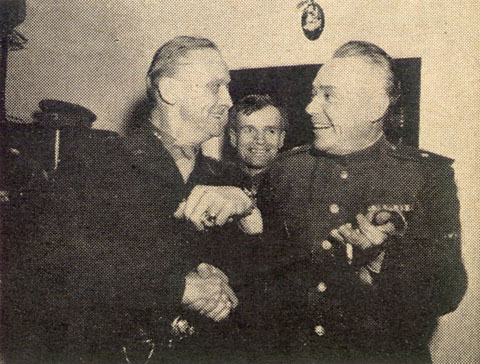 On 23 June 1969, troops of the 108th Airborne Regiment were tasked to fly from Kaunas to Ryazan, where they were to demonstrate their vehicle assault landing skills to the Minister of Defence of the USSR, Andrei Grechko. 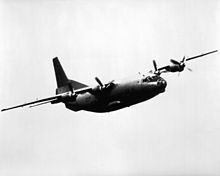 The group of three An-12 aircraft took off early in the morning, reaching a cruising altitude of 3,000 metres (9,800 ft). Approaching the city of Kaluga, a plane carrying the staff of a company and battalion command (91 officers and men) collided with an Ilyushin Il-14 passenger plane that was at 3000 meters without clearance, with the loss of all aboard. The division was involved in many major exercises and maneuvers, such as "Shield-76", "Neman", "West-81" (Exercise Zapad-81), "West-84" and "Watch-86", in the latter three exercises dropping airborne combat vehicles with crews, and receiving the Minister of Defence of the USSR Pennant "for courage and military prowess" during West-81. In 1971 and 1972, the division was awarded the Red Banner of the Airborne Troops. On 4 May 1985, for success in military training and in connection with the 40th anniversary of the Victory in World War II, the division was awarded the Order of the Red Banner. In 1988–1989, elements of the division took part in the Black January events in Baku. In 1993–1996, personnel from the 108th Regiment served on peacekeeping missions in Abkhazia to deal with the aftermath of the War in Abkhazia of 1992–1993. At some point after 1990 the division was given the 'Mountain' designation. Between January 1995 and April 2004, the 108th Regiment fought in the North Caucasian region, notably in the August 1999 battle for the "Donkey's Ear" heights in Dagestan. In 1997, the division's 97th Guards Airborne Regiment was disbanded. In August 2014 the division's 247th Guards Air Assault Regiment fought in the Battle of Ilovaisk during the War in Donbass, Ukraine. The division was subsequently awarded the Order of Suvorov in May 2015. On 6 October 2015 it was reported that the 7th Guards Airborne Division was deployed to Syria in support of Spetsnaz units in the Russian military intervention in the Syrian Civil War. In December 2016, Vladimir Shamanov announced that a separate battalion of the division's 97th Air Assault Regiment would be formed in Dzhankoy, with the rest of the regiment reformed from the battalion in the future. The regiment's equipment includes the BMD-1, BMD-2 and BTR-D vehicles, with the anti-aircraft BTR-ZD and anti-tank BTR-RD "Robot" variants of the BTR-D. The BTR-RD was equipped with the 9М111 "Bassoon" anti-tank rocket systems (capable of firing twelve 9М111 "Bassoon" or 9М113 "Competition" anti-tank guided missiles at a time). Artillery vehicles include the 2S9 "Nona" 120 mm self-propelled artillery vehicle and the 1В119 reconnaissance and fire-control vehicle. 108th Guards Kuban Cossack Airborne Order of the Red Star Regiment (Novorossiysk). From the time the regiment was formed until 1993, the regiment was based in Kaunas, Lithuania, military unit 02291. It was afterwards briefly stationed at Maykop. Since June 1994, the regiment has been based in the city of Novorossisk, military unit 42091. ^ a b "ведомственные эмблемы Российской Федерации". www.heraldicum.ru (in Russian). Retrieved 2016-08-01. ^ a b Sutyagin, Igor (March 2015). "RUSI Briefing Paper: Russian Forces in Ukraine" (PDF). Royal United Services Institute: 2. Retrieved 6 April 2016. ^ Robert G. Poirier and Albert Z. Conner, The Red Army Order of Battle in the Great Patriotic War, Novato: Presidio Press, 1985. ISBN 0-89141-237-9. Poirer and Connor drew upon wartime German Foreign Armies East data now with U.S. national archives. ^ "Biography of Major-General Dmitrii Aristarkhovich Drychkin - (Дмитрий Аристархович Дрычкин) (1902 – 1992), Soviet Union". www.generals.dk. Retrieved 2016-02-28. ^ Feskov et al, "Советская Армия в годы «холодной войны» (1945-1991)", p. 29, Tomsk: Tomsk University Press, 2004. ^ Holm, Michael. "22nd Guards Tank Division". www.ww2.dk. Retrieved 2016-04-29. ^ 7-я гвардейская воздушно-десантная краснознаменная ордена Кутузова II степени дивизия Журнал Братишка. ^ "7-я гвардейская десантно-штурмовая (горная) Краснознаменная ордена Кутузова 2-й степени дивизия" [7th Guards Air Assault (Mountain) Red Banner Order of Kutuzov 2nd class Division] (in Russian). Union of Russian Paratroopers. Retrieved 2016-08-13. ^ a b "Первый батальон 97-го полка ВДВ России развернут в Крыму в 2017 году" [First battalion of the 97th Regiment VDV to be deployed in Crimea in 2017] (in Russian). TASS. 14 December 2016. Retrieved 15 December 2016. ^ "Russian Paratroopers Miss The Killings - InformNapalm.org (English)". InformNapalm.org (English). 2015-08-20. Retrieved 2016-11-25. ^ "Седьмая десантно‑штурмовая дивизия Вооружённых сил России награждена орденом Суворова". 1tv.ru (in Russian). Retrieved 2016-08-14. ^ "Russia sends in Spetsnaz special forces to prop up Assad". Mail Online. Retrieved 2015-11-06. ^ Holm, Michael. "108th Guards Parachute Regiment". www.ww2.dk. Retrieved 2016-04-29. "Память народа::Поиск документов частей". pamyat-naroda.ru. Retrieved 2017-09-01.